Finding a deceased body of a loved one is a traumatic and emotionally draining experience. Do not attempt to touch or move the body as it can put your health and safety at risk. The body of a deceased person can harbor potentially infectious bacteria that can infect those who come into contact with it. So, what should you do if you find a dead body? To ensure your safety and follow the right protocol, follow these five steps. Do not touch anything. This could be a situation where a crime has occurred. Evidence cannot be interfered with. Bodies can also begin decomposing very quickly. Do not touch the skin or body fluid as the body may contain potential bloodborne pathogens that can infect you and others. Call 10111. 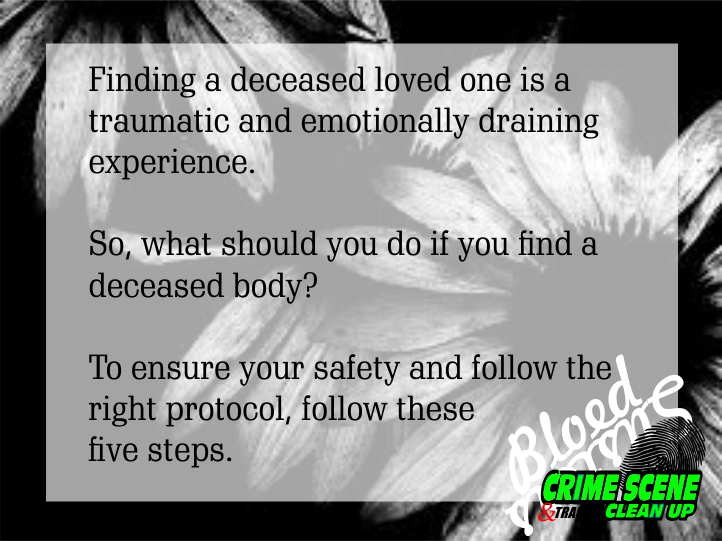 SAPS officials and paramedics can determine if the person is, in fact, deceased and can make educated decisions about the next steps. Ensure your safety. You do not know whether the dead person lost his or her life from violence, no matter how it may appear at first. If it seems the person was a victim of violence, communicate this when you call for help. If you feel like you could be in danger, remove yourself from the site and call for help from somewhere else. Cooperate with medical professionals and police. Since you found the body, you may be questioned by law enforcement. Be cooperative, and try to remember as much as you can about how you found the scene. If it is your responsibility to clean up, strongly consider getting professional assistance. Sometimes, a dead body is found in the home by a friend or relative, in which case the cleanup is the responsibility of the family or property owner. If you are tasked with the cleanup after the removal of the dead body, it is recommended that you seek professional assistance from a registered crime and trauma scene cleanup company rather than attempt the cleanup yourself. Bloedsusters Crime Scene Cleanup is a professional crime and trauma scene cleanup company. 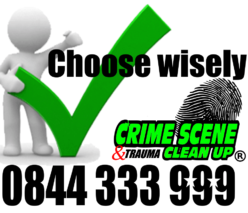 For 18 years, we have helped families by cleaning up and decontaminate the scene of a crime or trauma incident. For assistance cleaning up, contact us online or call us at 0844 333 999 for immediate assistance.